Britain will "pay the price" of a no-deal Brexit because complicated new border controls may not be ready in time, a government watchdog has warned. Thousands of UK exporters did not have enough time to prepare for new border rules, the National Audit Office said. Criminal gangs could exploit any border weaknesses and queues and delays were likely at border crossings, it added. The government said it was confident of striking a "good" deal with the EU for as "frictionless" trade as possible. It said that plans were already 95% complete. The National Audit Office acknowledged that government had made some progress on preparing for the possibility of a "hard" Brexit. It is the official body charged with scrutinising the operation of government departments and reporting to MPs so that they can hold the government to account. Its head, Sir Amyas Morse, said: "The government has openly accepted the border will be sub-optimal if there is no deal with the EU on 29 March 2019. "It is not clear what sub-optimal means in practice, or how long this will last. "But what is clear is that businesses and individuals who are reliant on the border running smoothly will pay the price." The NAO said that there was ￡423bn of trade which crosses UK borders every year, much of that with the EU or onto other destinations via the rest of Europe. Over 200 million people also cross the border. At present, Britain's membership of the EU single market and the customs union allows for the free movement of goods, people and services around Europe. There's more on those freedoms here. The NAO said that under a "no deal" up to 250,000 firms may need to fill out customs declarations forms for the first time as Britain moved onto World Trade Organisation (WTO) rules. The WTO governs global trading relationships between countries. Her Majesty's Revenue and Customs (HMRC) - which collects taxes at the border - could also have to deal with as many as 260 million customs declarations a year, up from 55 million. 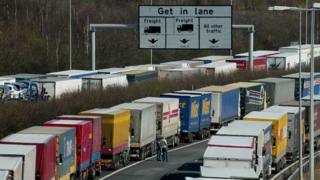 The NAO said that new border checks could lead to delays at crossing points, increased risk of customs non-compliance and queues of lorries, for example, trying to cross onto the European continent at Dover and Folkestone in Kent. The report also said that there was no agreement yet in place to deal with the issue of the border between Northern Ireland and the Republic - the only land border Britain will have with the EU after Brexit. Of 12 "critical" projects preparing Britain's borders for a no deal, 11 were "at risk of not being delivered on time and to acceptable quality", the NAO said. "Although the government has achieved much and its planning efforts have increased in momentum, given the scale of the task, there are inevitably gaps and risks to its progress that I am obliged to point out," Sir Amyas said. "But I do so while recognising that these are not normal times for individual departments or the government as a whole." The NAO said that properly policed borders were "fundamentally important to national security, effective trade, tourism, well-managed migration, healthy communities and the environment" and that there was a high level of risk that new border controls would not be ready on time. "Organised criminals and others are likely to be quick to exploit any perceived weaknesses or gaps in the enforcement regime," the NAO said. The NAO said there was a risk that organised crime could exploit any weaknesses in the border to smuggle goods into the country or traffic people in. However, the NAO's report said it recognised that the government was aware of the changing risks at the border. The government said it had made significant progress planning for a "no deal". "Extensive work to prepare for a no deal has been well underway for almost two years and we have robust plans in place to ensure the border continues to operate from the day we leave," a spokesman said. "Future IT systems and infrastructure are already being built and, as they do today, HMRC will continue to apply an automated, risk-based approach to customs checks. "This means any increase in the number of checks will be kept to a minimum. "We will always ensure we have the necessary resources to keep the border secure, and that's why we're recruiting approximately 600 Border Force officers to prepare for the day we leave the EU, in addition to the 300 officers which will be deployed by the end of the year." Is the Conway marriage a lesson for America? BBC Culture: What will be the next Game of Thrones? Quiz: Who did this group scrape past in YouTube rankings?